This is the proposed design for the Phillips pool rennovation that would inlcude a full eight lane competetive lap pool. This plan could be possible if the Minneapolis Public Schools board matches the Minneapolis Park and Recreation Boards $2.5 million investment. For some, swimming is a fun way to cool off in the summer, or exercise, but for others it instills fear and is inaccessible. The drowning rates in America show that the ability to swim is a privilege that many do not have access to. Public swimming pools in Minneapolis are rare, with only one pool for every 131,000 residents. Swimming access is an issue that is present in the Minneapolis community, and it affects who has the ability to swim. The few public pools in the city are located in higher-class, mostly white neighborhoods. As a result, Black people are three times more likely to drown as white people, with Hispanic and Native American people twice as likely to drown, according to the Center for Disease Control. South’s swim teams deal with the lack of pools every day they have practice. Minneapolis has two swim teams for its seven high schools. South is part of a combined swim team with Roosevelt and Washburn called SHAWARA. The other team is composed of Edison, Patrick Henry, and Southwest, although most of the swimmers are from Southwest. Southwest has their own pool located right in the high school, making scheduling practices relatively simple. Swimmers on the SHAWARA team split their time between practices during rented time at the YWCA, and evening practice at Southwest after the Southwest team practices. Traveling to Southwest during rush hour leads to some long commutes. “Even though practice is from 5:30 to 8, the whole time takes from 5 to 9,” said South swimmer Josh Emory. The SHAWARA team also sees a lack of diversity in its members, and the cause may be the wide gap in ability to swim according to race. In 2012, out of 7,890 year round competitive swimmers registered with USA Swimming from Minnesota, only 16 were African American, or about 2%. Senior Robel Tedros has taken a notice to the distinct absence of diversity on the team. “I’m Ethiopian-American, the other guy is Somali-American, and we’re the only two people of color on the team,” said Tedros. Although the rates of drowning are high and number of pools are low in Minneapolis, there are many efforts to change the statistics. One community-driven effort to provide pool access is Minneapolis Swims. Minneapolis Swims has now raised more than half the money to open a pool in Phillips community center. Opening a pool in the centrally-located Phillips neighborhood is a big deal. The pool would provide swimming access to a community that has many low-income residents and residents of color, and 20,000 kids live within a mile of the Phillips community center. 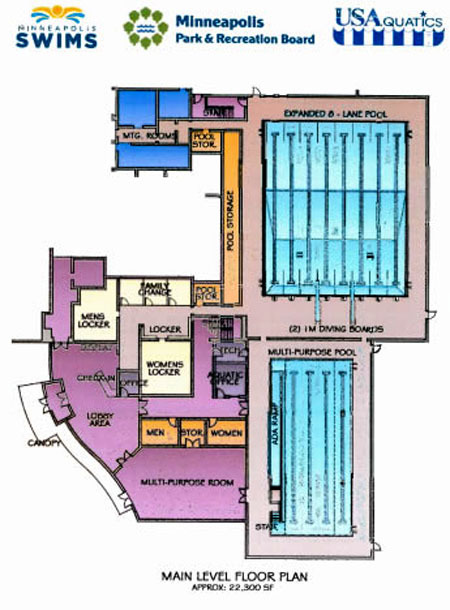 The pool that would be built in the Phillips community center would also become a place where South’s swim teams could have practice and swim meets, without having to take long bus rides or share with the YWCA. The pool would be equipped with 8 competition lanes and a 4-lane, shallow warm water pool where kids could have swimming lessons. The SHAWARA team is currently selling wristbands for $5 that will support the Sha-kym Adams “Learn to Swim” fund, in memory of Sha-kym, a South student who tragically drowned last summer. The fund, co-chaired by Sha-kym’s parents Kimberly Adams and Sharrod Rowe, will provide scholarships for swimming lessons for kids. Swimmers on the SHAWARA team agree that knowing how to swim is a very important ability. “When people learn that life skill, they won’t be in that danger zone or in an emergency circumstance,” said Tedros. Bennett hopes that the Phillips pool will benefit the kids that come to swim there. “[Swimming has] been proven to help with a number of things: health issues, grades and behavioral issues. There are all kinds of college scholarships for kids of color, when very few of them are involved in competitive swimming,” he said. Another effort to boost swimming access is a bill written by state representative Karen Clark, that would require Minnesota public schools to install swimming lessons into their curriculum. “Hopefully, [the bill will] eliminate some of the big disparities, the unfair disadvantage that young people of color and low income people in neighborhoods like ours, in South Minneapolis. It’s just unfair that we don’t have more access for people to learn how to swim, but we have more drownings.” expressed Clark.